When I first saw this painting it literally took my breath away, and that was just seeing it on my computer screen! It was frightening and beautiful at the same time. 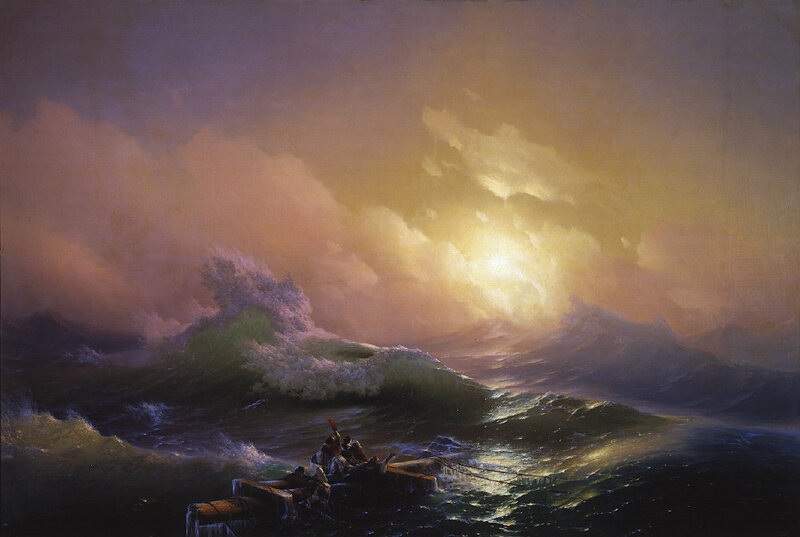 It was painted in 1850 by Ivan Aivazovsky, considered to be a great Russian seascape painter. You can see why! I like this portrait. 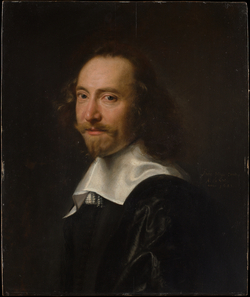 The sitter looks like he has a pleasant personality, instead of the stern faces we see on many of the old portraits. I wonder what his name was. His collar makes him look important, like an official of the court or a church. ALSO SEE: Rijksmuseum Amsterdam especially the Header. I guess you would call this a “ruched” collar. It’s also called a “ruff.” There’s a neck in there somewhere. I wonder what the collar was made of. It almost separates the head from the body. This lady also has a pleasant look to her. She has quite a high forehead. In some paintings I’ve seen, the ladies’ foreheads are extremely high – a fashion of the day or their natural physical appearance? And about this artist named “Rembrandt” – he’s pretty good! Here’s another portrait painted on an oval shape. The sitter’s hair and beard look like we could feel them with our hands. Again, there’s a ruffled, thick collar – maybe that’s where the name “ruff” came from. I wish I knew what his name was, and what he did for a living. He seems gentle-looking, but also strong-willed. If he had traveled to 22 Baker Street, Sherlock Holmes would have found out for us! Here’s a young lady wearing the same kind of “ruff.” The interior looks very dark; maybe it’s night-time. I wonder if the box at the left is her jewelry box, where she keeps her rings, and keepsakes. She looks sad, and quiet. Note from Merillion: It looks like this sitter is at a window, with the outer part of his hand resting on the sill. I believe the objects he’s holding are for the concept of the painting, not because he is in the described professions. His fingernails are dirty; his hands appear to be rough. There’s something about this fellow’s eyes – he looks a little sly and a bit mischievous! Note from Merillion: Frilly and frou-frou, but quite a collar, nonetheless! This collar stands higher at the back of the neck, which is how I would prefer to have worn it. 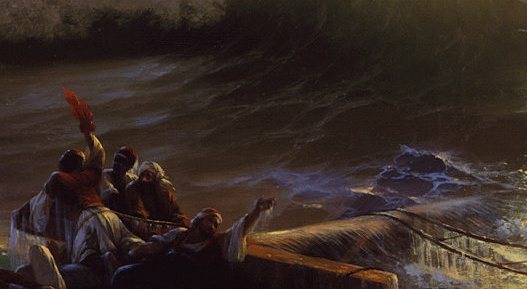 As stated above, this painting is a miniature. It amazes me that an artist can paint in an area so small! Here’s a “flat” type of collar, with a lace edging. Very nice-looking; this type of collar was worn by both men and women, as was the ruff collar. Giles Knox. 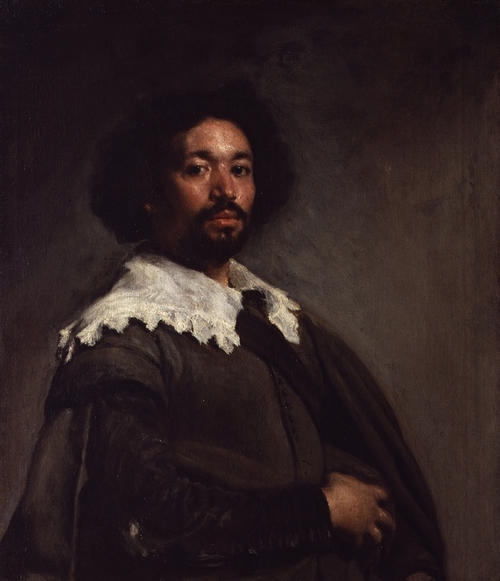 The Late Paintings of Velázquez: Theorizing Painterly Performance. Farnham, England, 2009, pp. 111, 113, fig. 4.6 (color), discusses the hierarchy of genres and Velázquez’s decision to present himself as a portrait rather than a history painter in his second visit to Rome; notes that portraits were seen as one notch above genre painting, since their subjects were so often of noble birth, but in the case of his portrait of Pareja, Velázquez “emphatically removed the nobility of the subject from the equation and thereby asserted the nobility of portraiture as portraiture,” a clear challenge to the accepted hierarchy. A little boy with a little collar (and cuffs). So beautifully painted, so charming! I had never heard of this artist, Drouais, but I like his work. Did this kid really stand still long enough for the artist to finish his work? Impossible! Also note this was painted on an oval canvas. Some subject matter just lends itself to the oval. I have to do some research on all these collars, to find out if the size of a collar had an important meaning. If it did, this must have been one very important woman! Was it difficult to eat while wearing this collar? Maybe it was removed while eating. She’s thoughtful in this portrait; maybe she was a teacher, or what we would call a “Principal” or a “Dean.” Also, here again is a very high forehead. I wonder if people in those days had a vitamin deficiency that caused balding, even in women. We’ve seen these collars from the 16th through the 18th centuries. Here we have a man from the 20th century, my paternal grandfather, wearing the same type of collar. Jacob Herre was active at St. Paul’s Lutheran Church in Berlin, New Hampshire, and at Bethany Lutheran Church in the Bay Ridge section of Brooklyn, New York, where my 2 sisters and I grew up during the 1940’s and 1950’s. I’m the oldest sister but I don’t have any memories of him – I guess I was too young. I find it so interesting that the same type of collar was worn relatively recently, as opposed to such a long time ago. I do wish I had known him. 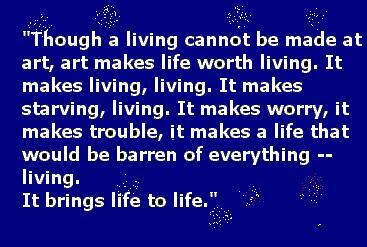 I don’t know who to attribute this quote to; I’ve had it in my file for a while. This is why we’re told to stand back and look at our paintings, otherwise we can get a little too involved with one nose!! But that’s the beauty of oil – you can change and cover up whatever you want.